I don’t care 4 dumplings not because of the “junk-food”saying,but its thick “饺子皮”（I don’t know how 2 express in English–U got It?right?）. I also think the saying is so weird,cos I never hear about this though I am Chinese.We just consider Mc’Ds food as junk food. The “modern” concept of healthy food (food pyramid, low salt/oil, etc) is promoted in China, but I wouldn’t say that is has really been adopted by many people yet. Traditional ideas of unhealthy might be something like eating too many “hot”-natured (热性) foods, etc. So, by what standard are Chinese dumplings unhealthy? In fact, on that note, I can see that dumplings might be considered a kind of 小吃 (snack), in the same category as lamb kebabs, glutinous rice balls, stinky tofu, etc, but do Chinese actually consider these kinds of food unhealthy? In English, “snack food” is associated with the idea of unhealthiness, but is the same true in Chinese? Except for very few good brands, Chinese dumplings are very bad for you. John B and I used to eat a lot, because they are easy to cook and very “delicious”. One day, my mom told me the secret of how they make “delicious” dumplings. They use low quality grease. First, the meat inside is not good and has a lot of fat. Then they spread oil made of animal fat, not vegetables, on the filling. You know, generally grease makes food delicious, but it’s bad for your health. haha, 饺子’s my favorite food. i hope i can eat them the year round. what kinda 馅 do you prefer, John? and the brand? me like 湾仔码头. I use the same sauce (only when there’s no tabasco!) but I find it a bit sweet. Are you using some kind of anti-spam plugin? I haven’t been able to post a comment here earlier. Then i used secure-tunnel. The only reason the dumplings you’re eating is considered ‘junk food’ is because in store bought frozen dumplings they use crappy meat (very fatty pork). If you make it yourself and put in good quality pork(chicken/beef/lamb) and vegetables, those dumplings would be no worse for you than stir fried pork and vegetables, and there would be more oil in the stir fried stuff than the BOILED home made dumplings. I found a lady down the street here in Asheville, NC that makes some nice dumplings. By nice, I mean fattening and greasy. You know, only modern man is so spoiled as to demand different foods for each meal. Back in the old days, he ate the same crap every single meal of every single day. I was reading about the Spanish conquistadors recently, and they subsisted on these hard-as-rock biscuits called hardtack for months–and they conquered 2 continents! So I don’t see why modern man cannot subsist on dumplings forever, especially if they’re only eaten once a day. So with that in mind, I just got me some frozen dumplings at Ranch 99 Supermarket down the street. $7 for 2 BIG bags plus $3 for a couple of sauces. So $10 total for maybe 8 meals. 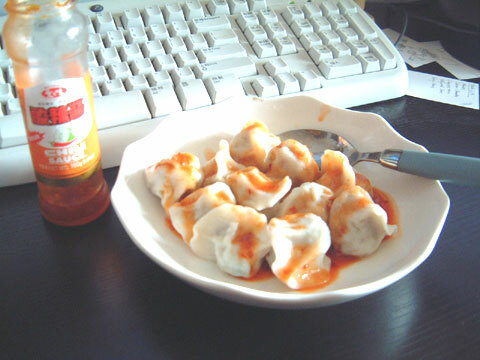 I intend to eat these dumplings everynight for dinner cuz they’re A) cheap and B) not too bad nutritionally. If I can keep this up, I should be able to save a lot of money. Ahh big sausage, I tried that dumpling diet before. Though I had the fortune of alternating it with those frozen (but fresh) noodles in small plastic bags and tons of sauce. (Much healthier than my ill-conceived two week potatoe chip binge) However, the truth is that the store bought frozen dumplings can never hope to match home made. When I was visiting home during the summer, I finally stayed around long enough in the kitchen to learn just how my mother makes them. I personally prefer all home made dumplings, filling and flour. Perhaps I’m quite different from other Chinese, but I prefer my dumpling skins a little thick, especially compared to store bought wrappers and I will always preferred them steamed over boiled. My favourite flavour is eggs and leeks (it takes me back) which is absolutely delicious and is making me hungry as I type. Unfortunately though, making dumplings (including the skins) is a somewhat time consuming task compared to dropping them wholesale into a pot of boiling water or sticking something in the microwave. Wow, I got to stop getting my dumplings from chinise food places! Just came across this site when I googled about unhealthy frozen dumplings. I just cleared an entire pack of 15pcs. of Wanchai Ferry frozen mushroom and chicken dumplings. Although they are cheap (11RMB for a pack of 15pcs.) and taste good, I think they add a lot of fatty pieces of animal in the filling. I used to think they were healthy, but in fact they are unhealthy seeing as how a lot of oil ends up in your bowl of soup after eating them. Even during chewing, you can feel the chewy texture of fat pieces in the filling. So even the “better” brands are unhealthy. I try to eat them a little less because of this, but I don’t have much choice living in some small town in China.